The capacitors making up the POWER-9 series are used for static power factor correction of a wide range of motors and transformers. This series share the same internal configuration, with three capacitor elements wired internally in a delta connection. The overpressure protection system is specifically dimensioned so as to constantly ensure maximum safety in terms of ground protection and protection against the risk of arcing, even in conditions where there is a high energy density. In these series HEAVY DUTY of resin-impregnated capacitors, the three elements are housed in a plastic container which, together with the impregnating agents, assures dual insulation between the wound cores and metal enclosure. To guarantee perfect filling during the resin impregnation process, the process itself is carried out prior to the elements being placed in the enclosure; in this way the distribution and uniformity of the impregnation can be subjected to a complete visual and dimensional inspection. 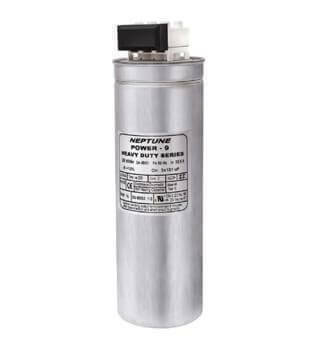 NAAC ENERGY CONTROLS PVT LIMITED offers under NEPTUNE brand the most advanced and best in World Power Quality Solutions like Dynamic Thyristor Switched Real Time Power Factor Correction Systems,Detuned / Tuned APFC / Harmonic Filtration Equipment, passive harmonic filter for VFDs, Active Harmonic Filtration System and their Hybrid combination. Our service division offers high quality power quality audits, root cause analysis and comprehensive energy audits of Industrial and commercial installation. With more than 20 years of experience, in fact we were first companies in India to redirect our resources in tackling these Power quality issues. The result is the state of Art and highly technical solutions developed by us with foreign collaborations. The solutions are having unmatched features and advantages. All this is well supported by our excellent sales and service network. We have successful and satisfied Customer base of our products and solutions, with more than 24000 installations in India and abroad in field of Reactive and power quality management.